Транспортный самолет D.332 представлял собой цельнометаллический свободнонесущий низкоплан и был рассчитан на перевозку восьми пассажиров. 11 июля 1933 года он совершил первый полет под управлением Марселя Доре. Пилоты располагались в кабине рядом, а непосредственно ДальшеMore>>> за ними - радист. Пассажирский салон был просторным, хорошо отапливаемым и вентилируемым, а кресла могли складываться таким образом, что образовывали спальные места для более комфортных ночных перелетов. Силовая установка включала три звездообразных двигателя Wright Cyclone мощностью 575 л.с. (429 кВт), построенных по лицензии под обозначением Hispano-Suiza 9V. Самолет получил название "Emeraude" ("Изумруд"), Он совершил ряд демонстрационных полетов в столицы европейских государств, а 7 сентября 1933 года даже установил мировой рекорд, преодолев 1000-км маршрут с полезной нагрузкой 2000 кг и средней скоростью 259,56 км/ч. Предполагалось, что самолет будет эксплуатироваться на перспективной авиалинии компании "Air France" в Сайгон, поэтому 22 декабря 1933 года D.332 отправился в пробный полет по этому маршруту и прибыл в конечный пункт назначения 28 декабря 1933 года(время в полете составило 48 часов). Однако на обратном пути примерно в 400 км от аэропорта Ле-Бурже самолет потерпел катастрофу - во время снежного бурана машина врезалась в холм около Корбиньи, все находившиеся на борту погибли. D.333: компания "Air France" заказала три самолета D.333 - более грузоподъемной версии D.332, с усиленной конструкцией. Машина могла перевозить до 10 пассажиров. Данные самолеты несколько лет эксплуатировались на отрезке Тулуза-Дакар (Западная Африка) южноамериканского маршрута "Air France"
D.620: вариант D.338 с тремя звездообразными двигателями Gnome-Rhone 14Krsd мощностью 880 л.с. (666 кВт), оснащенными турбонагнетателями, и пассажировместимостью на 30 человек. Был построен только один самолет, но в эксплуатацию он так никогда и не поступил. Дальнейшая судьба его неизвестна. 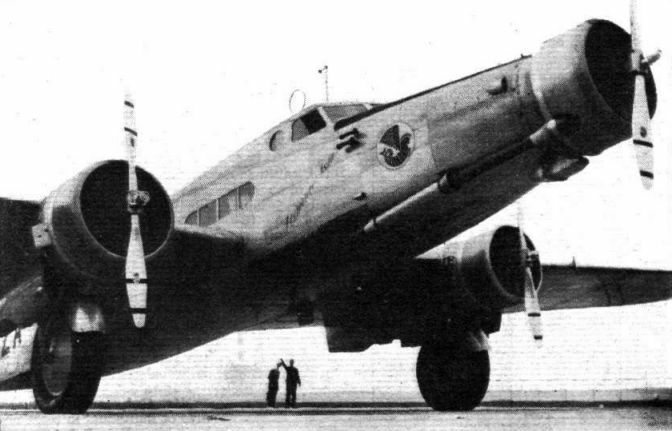 THE new Dewoitine three-engine, low-wing cantilever, Transport Monoplane, built at Toulouse for the Air Orient Co., has just arrived at Villacoublay to undergo its official trial tests by the Service Technique. This machine, of metal construction throughout, is designed primarily for long-distance rapid-transport service on the Far-Eastern sections of the Air Orient system. Equipped with three Hispano-Suiza, type 9V., air-cooled radial engines, having a rated power of 575 h.p. and a maximum power of 650 h.p. each, this plane has a maximum speed of 187 m.p.h. (300 km./hr.) and a cruising speed of 156 m.p.h. (250 km./hr.). The flight radius is some 1,250 miles (2,000 km. ), and the ceiling with one engine stopped 3,000 m. (9,750 ft.). The plane carries two pilots, a radio operator and a mechanic, and is designed to transport a commercial load of 1,200 kg. (2,640 lb. 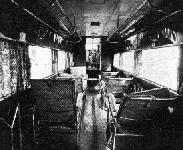 ), consisting of passengers and freight. The cabin is fitted with eight large reclining chairs to be used by passengers during the long flights of the night services. Piloted by Marcel Doret, the chief pilot of the Dewoitine Co., this plane flew from Toulouse to Paris, a few days ago, having six passengers on board, in 2 hr. 22 min., at a cruising speed of 250 km./hr. (156 m.p.h.). The wings are of the standard Dewoitine single-spar type of construction with two box spars, one on each side of it. The form is a trapezoidal one, tapering to a distinct elliptical shape at the extremities. They consist of a centre section built into and forming part of the fuselage, to each end of which the wings are joined. A wing covering of smooth sheet vedal (duralumin alloy) is used. The seats of the two pilots are enclosed and installed, side by side, in the front part of the fuselage. The plane is equipped with dual controls, the seat of the radio operator being behind those of the pilots. The cabin containing the eight passenger reclining chairs is in the centre, and a large baggage hold of 69 cu. ft. (2 cu. m.) dimensions is installed in the after portion of the fuselage. The engine mountings are constructed of chrome nickel steel tubing reinforced by steel ribs. The landing gear is in two independent units, each one of which is installed under a lateral engine Each unit is equipped with Messier Oleo-pneumatic shock absorbers, and the wheels are fitted with spats. A tail landing wheel is used, mounted on an oleo-pneumatic shock absorber. The fuel tanks have a capacity of 3,200 litres (711 British gallons approx. ), and are equipped with quick-emptying devices. Each engine has an oil tank of 85 litres (19 British gallons) mounted behind the fire wall. 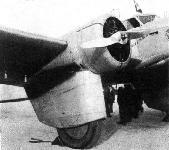 The plane is equipped with two-bladed metallic Levasseur propellers. The principal characteristics of the D.332 are:- Wing span, 29 m. (94 ft. 3 in. ); length o.a., 18,95 m. (61 ft. 7 in. ); height, 5,45 m. (17 ft. 9 in. ); wing surface, 96 m.2 (1,014 sq. ft.); weight of plane, empty, power plant and fixed installations included, 5,280 kg. (11,616 lb. ); fuel, general and special equipment, including crew, 2,870 kg. (6,314 lb. ); pay load, 1,200 kg. (2,640 lb. ); total weight, 9,350 kg. (20,570 lb. ); maximum speed, 300 km./hr. (187 m.p.h. ); cruising speed, 250 km./hr. (156 m.p.h. ); ceiling (one engine cut out), 3,000 m. (9,750 ft.). The Dewoitine “Antares" to be put on the Far Eastern Service this year: A Development of the Ill-fated "Emeraude"
THE first of the new Dewoitine three-engined low cantilever wing monoplanes, which have been ordered by Air France for operation on its Far Eastern and other long-distance routes, has been completed and will shortly begin its trial flights. This machine, known as the "Antares," or 333, is similar in design to the ill-fated "Emeraude," but has been largely strengthened throughout. It now has a load factor of seven, an increase of two on that required by the C.I.N.A. The "Antares" is constructed of metal throughout, and is designed to carry eight passengers, who will be seated in large reclining chairs which can be used for sleeping. There are also two large holds in which postal matter, baggage or freight can be carried. The centre section, in which are located three tanks with a total capacity of 712 gallons, is built into, and forms part of, the fuselage. On each side of this three lateral panels are joined, and the wing structure itself consists of a main spar located about a third of the chord from the leading edge and of two intermediate spars placed at the rear end of the fuel tanks, which are installed behind the engine mountings. The spars, together with the ribs, are constructed of duralumin, and a smooth Vedal sheet metal stress-carrying covering completes the structure, which has a box form, on each side of the centre spar. The fuel tanks, incidentally, are equipped with independently operated dumping devices, and oil tanks, of 18.7 gallons capacity each, are installed behind the engine. The engine mountings are of chrome-nickel steel tubing reinforced by steel ribs. Of monocoque construction, the fuselage is also covered with Vedal sheet, and the structure is composed of bulkhead frames and intermediate formers connected by four main spars and reinforced by stringers, all of which are made of duralumin. It is divided into three sections. The forward part contains an enclosed pilot's compartment with two side-by-side seats equipped with dual controls. The radio operator is located behind, and a baggage hold of 24.7 cu. ft. capacity is located underneath the central oil tank. The central portion contains the cabin, which is 19.7 ft. long, 5 ft. wide and 5.7 ft. high. Behind the cabin is a lavatory. The after portion of the fuselage contains a second hold of 70 cu. ft. capacity. The empennage is likewise of metal and is composed of spars and ribs of duralumin covered with Vedal sheet. The tail has swivel wheel attached to an oleo-pneumatic shock absorber. The cantilever undercarriage consists of two independent parts, each of which is located under one of the outboard engines. Messier shock absorbers are used and the wheels are in well-faired "trousers." Three Hispano-Suiza nine-cylinder radial engines, type 9V, rated at 575 h.p. each, are fitted with N.A.C.A. cowlings and two-bladed Levasseur airscrews. With these engines the maximum and cruising speeds are 187.5 and 160 m.p.h. respectively, and the cruising speed at 55 per cent, of the full power is 140 m.p.h. The flight radius is 1,260 miles with normal load. These particular engines have been considerably "stepped up" recently, and it is understood that the latest types deliver something like 700 h.p., so an improvement in performance may be expected if they are fitted. Another development of the "Antares" is being constructed to carry 30 passengers, and it is possible that this D.620 type, as it is known, will be used on the cross-Channel service this year. The new Dewoitine, a development of which may be used on the Channel services this year. The Dewoitine D.332 three-engined transport monoplane ( Hispano-Suiza 9V engines). It is intended for service on the Far Eastern air routes. It is difficult to imagine anything cleaner aerodynamically, than the Emerald when viewed from ahead. AIR-FRANCE AND I.A.T.A. 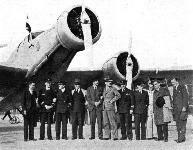 : The French delegates to the International Air Traffic Association arrived at Croydon on September 26 in the new Dewoitine D.332. Left to right: MM. 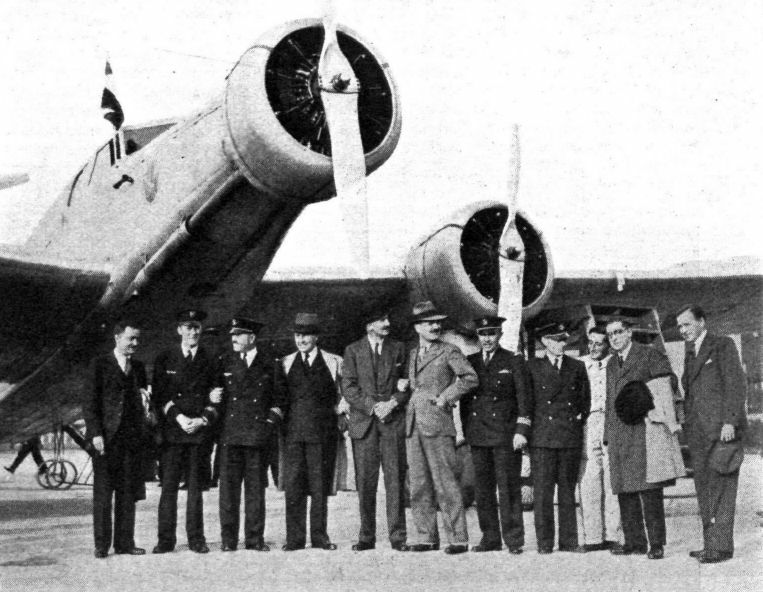 Oger Bajac, Chief Pilot, Air-France; Doret, Chief Pilot, Dewoitine; Briend, General Secretary, Air-France; Wooley Dodd, Manager, European Division, Imperial Airways; Allegre, Managing Director, Air-France; Burello, Second Pilot; Queyret, Wireless Operator; Crampel, Mechanic; Gavay, Bank of Indo-China; and Mr. G. MacKinnon, Arrow Aircraft Insurance Association. This shows the clean way in which the wing engines have been streamlined into the wing and undercarriage fairing. This latter forms an excellent shield to prevent the glare of the landing flares disturbing the pilot. THE FLIGHT TO MOSCOW: The new Dewoitine D.332 monoplane just before leaving Le Bourget for Moscow, with M. Pierre Cot, Air Minister, on board. The Dewoitine D.332 L’Emeraude at Croydon on September 26, 1933. The passengers have large windows in the cabin of the Emerald. When necessary the Emerald can climb very steeply. 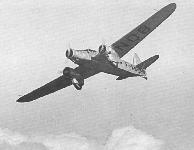 The second D.333, F-ANQB Cassiopee. The D.333 F-ANQA Antares at Le Bourget. In the background is an Air France Wibault 283. F-ANQA Antares, the D.333 prototype, at Le Bourget. In the background is the Boulton & Paul P. 71A Boadicea. F-AOZA Clemence-Isaure, the prototype D.338. D.338 F-AQBL Ville d’Orleans at Le Bourget. This example has auxiliary fins mounted on the tailplane. 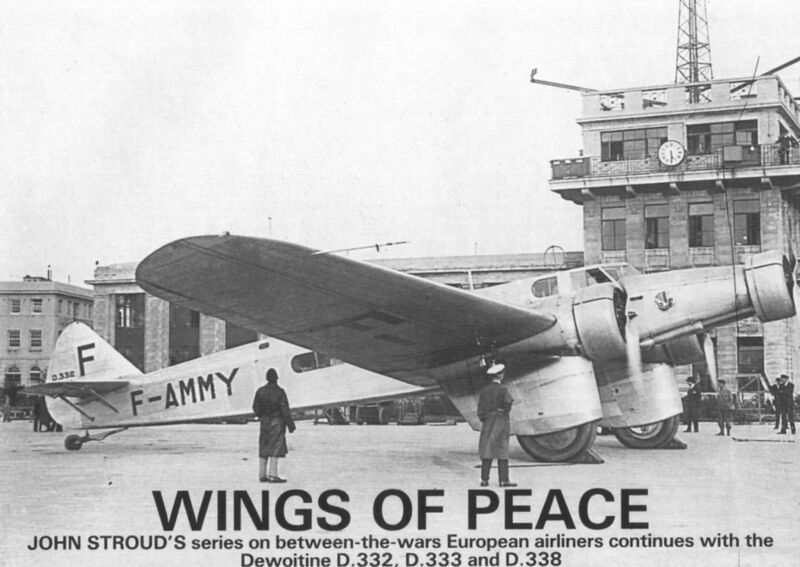 Beyond is the Bloch 220 F-AQNM Provence. 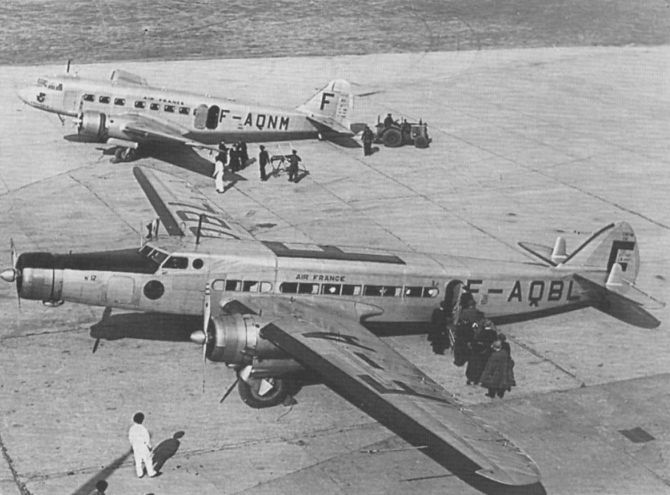 F-ARIB Ville de Bangkok was one of the 1939 batch of D.338s. It is seen at Marignane, Marseilles, and survived until 1946. The Dewoitine D-338 Twenty-four-passenger Monoplane (three 645 h.p. Hispano-Suiza 9V engines). AIR FRANCE'S LATEST: The twenty-two seater Dewoitine 338 which will shortly be paying a visit to Croydon. This machine has been developed from the 333, three of which are being used on the Toulouse - Dakar section of the South Atlantic service. The extra drag of a wider fuselage has been compensated by the use of a retractable undercarriage and the top speed is only just short of 200 m.p.h. A fleet of these machines will be used on the London-Marseilles service pending the completion of the big Farmans, alter which they will go East. A DESERT HALT. - Port Etienne, on the Northern frontier of Senegal, is mostly sand and mongrel dogs. The Dewoitines of Air-France are its bi-weekly excitement. IN SIAM. - A couple of Air-France Liners on the Don Muang Aerodrome; the Airport of Bangkok. Оснащенный тремя 650-сильными двигателями 9V-16/17, самолет D.338 развивал максимальную скорость 301 км/ч. D.338 F-AQBF, which operated the inaugural Hong Kong service. The undercarriage has the standard wheel fairing. 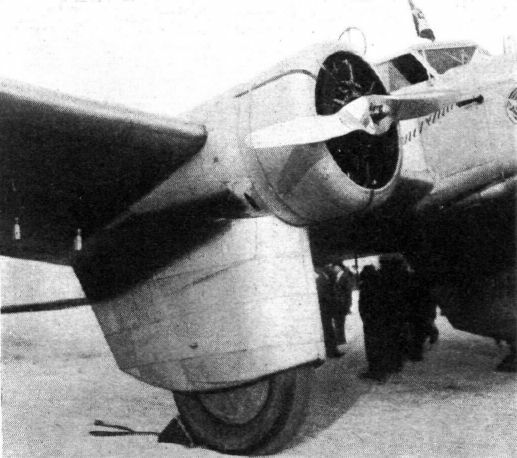 The sole example of the Dewoitine D.342. CONTINENTAL: This is the one of most recent French efforts at building thirty-passenger transports. It was designed to meet the requirements of Air France. The Dewoitine D-620 has three Gnome-Rhone Mistral Majors, moderately supercharged to give 880 h.p. at 6,500 feet. Maximum speed is estimated to be in the neighbourhood of 220 m.p.h. 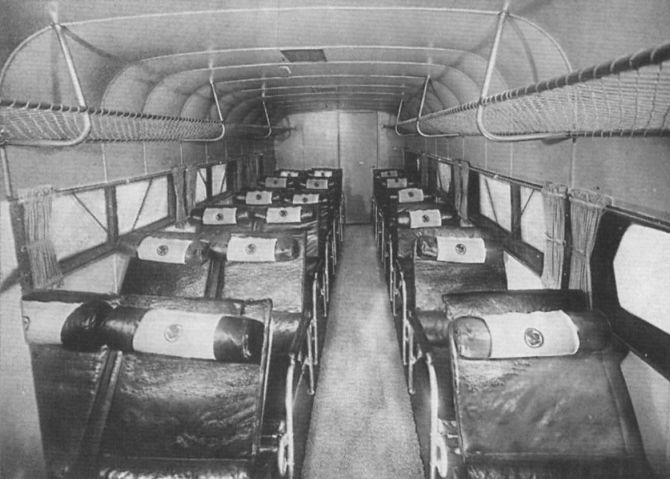 The cabin of the Dewoitine D.332, showing the large reclining chairs for passengers on long night flights. The main cabin of an Air France D.338 configured for European services. 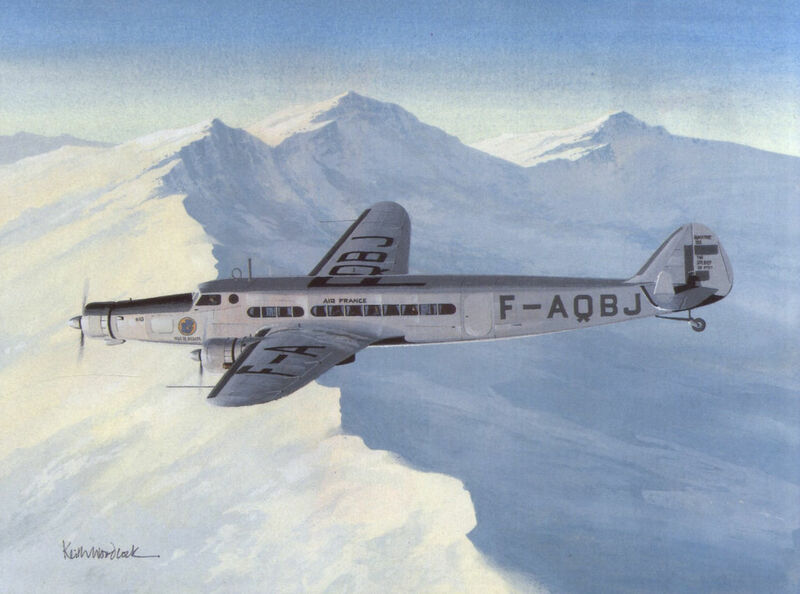 KEITH WOODCOCK'S colour painting shows the No 10 Dewoitine D.338 F-AQBJ Ville de Calcutta, which was used on Air France’s Far East services.